From the road, it’s a scene reminiscent of Arlington National Cemetery. But instead of marking soldiers lost in battle, the grave markers at Resurrection Parish in Lexington represent the unborn. Founded in 1969 and constructed in 1970, Resurrection Parish has been serving area Catholics for 45 years. 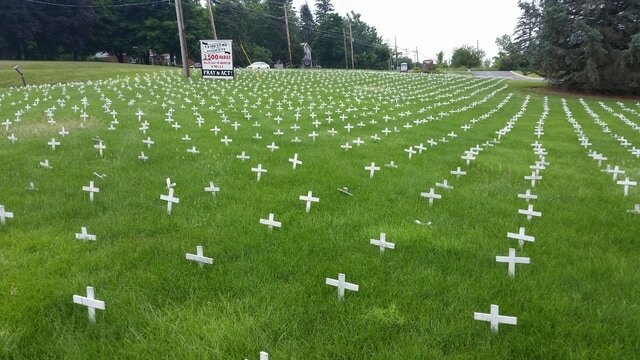 Currently, the parish is displaying seemingly endless rows of crosses on its front lawn to raise awareness for the 3500 fetuses that are aborted on a daily basis. Dubbed the “Cemetery of the Innocent,” the few thousand white markers are a collaborative effort among Resurrection Parish in Lexington, St. Peter’s Catholic Church in Mansfield and St. Mary’s Catholic Church in Mansfield. Resurrection Parish in Lexington has members from Galion. The cross display had been on a nine-year hiatus returning to Resurrection this spring after being refurbished by inmates at the Mansfield Correctional Institution. The display has gotten a lot of attention from passing motorists. The display is just one of many initiatives the pro-life group at Resurrection does throughout the year. It is part of their effort to get their message across to a broader audience. The group aims to gain awareness for their cause and ultimately overturn the Supreme Court decision in Roe v. Wades. The church is located at 2600 Lexington Ave. and celebrates Mass on Saturdays at 6 p.m. and Sundays at 8:30 a.m.